The officials may face dismissal from service, forfeiture of length of service, demotion or any other punishment prescribed in the service rules and regulations. According to a senior officer, the Lesco administration has also decided to look into the affairs of Okara and Sheikhupura circles in view of the overbilling and other complaints. 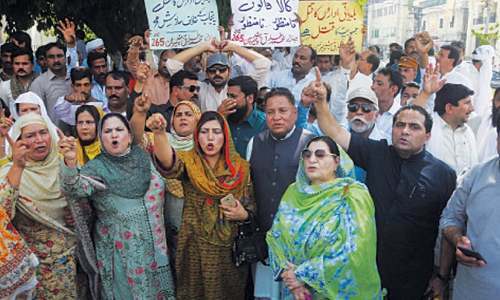 The Lesco administration last month declared its 530 officials including 100 SDOs/assistant managers operations guilty of resorting to overbilling to cover up the line losses in many areas of Kasur circle. The action had been taken against the officers/officials under the Lesco rules and regulations after a ministerial inquiry committee and the Public Accounts Committee (PAC) sought to do so in the light of an audit para that pointed out overbilling worth more than Rs3.5 billion. “Half of the 530 employees who had been found guilty of committing the offence are likely to face major penalties such as removal from service, demotion, forfeiture of service for years or forced/compulsory retirement. And others may face relatively minor penalties subject to gravity of offence,” Lesco Chief Executive Officer Syed Wajid Ali Kazmi told Dawn on Tuesday. He said 530 employees (130 meter reading supervisors, 300 meter readers and 100 SDOs) had started giving replies to the charge-sheets to Lesco’s Human Resource Department that is supervising the entire process to take appropriate action. He said all the officials would be given a fair chance of pleading their cases before the competent authorities. SYSTEM CONSTRAINTS: A meeting to review and check the constraints in the National Transmission and Dispatch Company (220kV and 550kV grids and transmission lines) and the power distribution companies will be held on Aug 4. The Pepco managing director is expected to preside over the meeting at Wapda House on Aug 4.